Two closet installers end up in a Palestinian village where they are detained by policemen and threatened. Two Israeli closet installers were on their way to the town of Ma'aleh Amos in Judea were directed through a Palestinian village by the Waze app. There they were arrested by Palestinian Authority policemen who collected a heavy customs tax from them for having passed through a "foreign country", and this only after the two closet installers found themselves in an interrogation room in an old abandoned building, surrounded by at least a dozen Palestinian Authority policemen and civilians. "We thought this was the end," said Danny, one of the installers. Danny Yonov told Arutz Sheva about his experiences after he left for a closet installation in Ma'aleh Amos with the truck driver Boris. He wrote the intended destination into Waze and they started on their way. At one of the traffic lights the app directed them to turn left and pass through an Arab village. As people who regularly install closets in the area the two didn't find this in any way irregular and proceeded into the village. Right as they entered, however, a Palestinian Authority policeman in an olive-green uniform ordered them to halt. "I didn't recognize the uniform, and the thought went through my head that he's probably a Palestinian policeman or soldier," Danny recounted. Another man in a gray uniform stood nearby. The two Palestinians asked Danny and Boris if they speak Arabic or English, to which they answered that they only speak Hebrew or Russian. The policemen told them to drive back a bit and produce documents. "They asked my driver to come with them into an office," Danny, who remained in the truck, explained. But when he saw that the driver isn't coming back he called the factory where he works and asked for an Arabic speaker. When one was found and put on the line Danny went into the building which Boris the driver had been brought into. The office he entered looked terrible, like an abandoned building, Danny described. "I didn't think about anything other than how we can get out of there. I gave the policeman the phone so the guy from the factory can explain to him that we're from the closet factory and were on our way for an installation in Ma'aleh Amos. But they didn't care. They laughed." When they first entered the building there were two Palestinian Authority policemen, but as time went on more and more people joined their number until there were 12-14 policemen and civilians in the room. One of them asked the two installers whether they were Jewish. In a decision made on the spot Danny decided to say no, they were both Russians who came to Israel to work. From that moment on Danny and Boris only spoke Russian between themselves, "because we thought maybe some of the Palestinians do understand a little Hebrew. "One asked if I'm a soldier. I said no. He asked if I once was a soldier and I said yes. He then asked where we were going to, and if I was undercover. He asked for our ID cards." Danny explains that he didn't have his ID card on him, but only a membership card from the Yisrael Beytenu party. He handed over the card and the Palestinians handed it around. Danny didn't understand how the Arabs didn't see the contradiction between the claim that they were non-Jewish workers form Russia and his membership in the party. "In order to try to keep things on an even keel I decided to try humor," Danny continued, "they said we need to pay customs because we'd crossed into a foreign country. I asked for coffee because I figured if this is the end, at least let's drink some coffee." There were also ominous hints in the air in those moments in the interrogation room. "A guy came in and made hand gestures showing he wanted to shoot me in the head. Another guy told him 'leave it'," Danny continued. Later on they got an order to unload their merchandise from the truck and leave it there if they're not willing to pay the customs tax. They then called back to the factory and asked them to send a document testifying to the low value of the merchandise in the truck, so as to keep the "tax" as low as possible. Danny describes their feeling at this point as full of horror and apprehension of an impending lynching. Meanwhile, at the factory, it appears the seriousness of the situation wasn't well understood, and security forces weren't called. The secretary at the factory even joked and said that they should pay the tax and they'll be reimbursed for it, but this is the last time she's paying to get them out. Danny didn't think this was particularly funny. Around two hours later, and after they payed 850 shekels for a "customs tax", the were let go and allowed to proceed to the outskirts of the village, where two policeman and a Civil Administration officer were waiting for them. These security personnel were satisfied with writing down Danny and Boris' ID numbers and a quick look at the truck to make sure it indeed contained only closets. Danny summarized the experience with a series of questions he says Israel's security apparatus must answer: Why weren't there clear signs that would prevent people entering the village unsuspecting? Why didn't Border Policemen prevent them from going through the village? And why were they not summoned for questioning and debriefing after the incident? "God wanted to send us a message, but what happens with other people, tourists who don't know the area?" Danny asks. Arutz Sheva sent Danny's questions to the relevant security bodies, but the police claimed they were unaware of the incident. 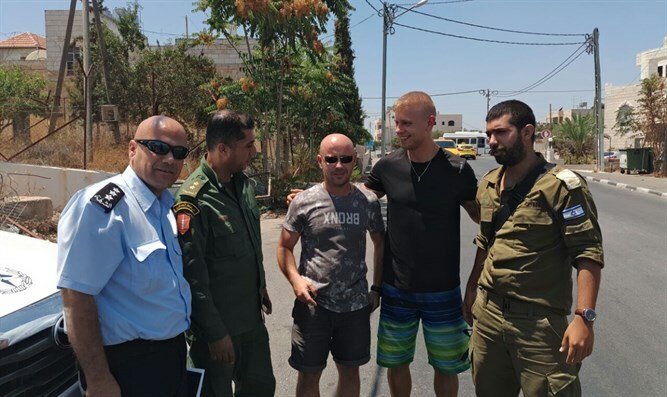 The Civil Administration spokesman's office responded to inquiries regarding the incident: "This was an incident where two Israelis mistakenly entered area A, whereupon the Palestinian security authorities rescued them and safely returned them to Israeli security forces." Regarding the hefty sum the two were required to pay as customs tax, the Civil Administration says that "the matter of the customs tax is inappropriate and a complaint regarding this matter has been sent to the Palestinian customs police." Security body representatives told Arutz Sheva that any potential investigation into the matter is the province of the police and not the IDF or the Civil Administration. However, as had been mentioned, the police deny any knowledge of the incident.